William Burnet (March 1687/88  – 7 September 1729) was a British civil servant and colonial administrator who served as governor of New York and New Jersey (1720–1728) and Massachusetts and New Hampshire (1728–1729). Born into a position of privilege (his godfather became William III of England not long after his birth, and his father Gilbert Burnet was later Bishop of Salisbury), Burnet was well educated, tutored among others by Isaac Newton. 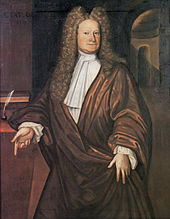 Active for most of his life in intellectual pursuits (he was elected a Fellow of the Royal Society in 1705/6), he occupied no posts of importance until financial considerations and political connections brought him the governorships of New York and New Jersey. His tenure in New Jersey was without major controversies, although he set a precedent there for accepting what were effectively bribes in exchange for his assent to legislation. In New York he sought unsuccessfully to end the fur trade between Albany and Montreal in order to implement a colonial policy preferring direct trade with the Native Americans in central North America. His New York rule was marked by an increase in political divisions between land owners (with whom Burnet sided) and merchants. After the death of King George I, King George II appointed Burnet governor of New Hampshire and Massachusetts. Although his New Hampshire tenure was inconsequential, he engaged in a nasty dispute with the Massachusetts assembly over the issue of his salary, holding the legislative body in session for six months and relocating it away from Boston. The dispute held up other colonial business, and was ongoing in September 1729 when Burnet died; his death was apparently caused by illness contracted after his carriage overturned and dumped him in water. William Burnet was born in The Hague, a leading city of the Dutch Republic, in March 1687/8. He was the first child of Mary (Scott) Burnet and Gilbert Burnet, the leading theologian in the Dutch court of William, Prince of Orange (who was Burnet's godfather) and his wife Mary. Mary Scott Burnet was the heiress of a Scottish family which had settled in the Netherlands and acquired great wealth: her marriage to Gilbert however was generally agreed not to be for money, but a genuine love match on both sides. There were six younger children, of whom four survived infancy. Later in 1688 William led an army across the English Channel in the Glorious Revolution, and William III and Mary II ascended to the English throne as corulers. Burnet's father gave the coronation sermon, was later elevated to Bishop of Salisbury, and was an ongoing influence in the English court during King William's reign. He fell out of favour when Queen Anne took the throne in 1702. Burnet's mother died of smallpox in 1698; in accordance with her dying request his father two years later remarried her close friend Elizabeth Blake, who proved a kindly stepmother to William and his siblings. All of them were devoted to Gilbert, "the best of fathers". On Gilbert's death in 1715 William inherited one third of the estate which, given his mother's wealth, must have been considerable. ^ a b c In the Julian calendar, then in use in England and its colonies, the year began on 25 March. To avoid confusion with dates in the Gregorian calendar, then in use in other parts of Europe, dates between January and March were often written with both years. Dates in this article are in the Julian calendar unless otherwise noted. ^ a b "Biography of William Burnet" (PDF). State of New Jersey. Archived from the original (PDF) on 22 March 2012. Retrieved 24 September 2012. ^ "Burnet, Gilbert" . Dictionary of National Biography. London: Smith, Elder & Co. 1885–1900. ^ "Stanhope, George" . Dictionary of National Biography. London: Smith, Elder & Co. 1885–1900. American Quarterly Register, Volumes 13–14. Boston: American Education Society. 1841. OCLC 1480639. Belknap, Jeremy (1812). The History of New Hampshire, Volume 2. Dover, NH: Mann and Remick. OCLC 1387107. Bonomi, Patricia (1971). A Factious People: Politics and Society in Colonial New York. New York: Columbia University Press. OCLC 164631994. Cohen, I. Bernard; Smith, George, eds. (2002). The Cambridge Companion to Newton. Cambridge, UK: Cambridge University Press. ISBN 9780521651776. OCLC 186428681. Doyle, John Andrew (1907). English Colonies in America, Volume 5. New York: Henry Holt. OCLC 2453886. Fleming, Thomas (1984). New Jersey: A History. New York: Norton. ISBN 9780393301809. OCLC 10557902. Fumerton, Patricia; Guerrini, Anita; McAbee, Kris (2010). Ballads and Broadsides in Britain, 1500–1800. Burlington, VT: Ashgate. ISBN 9780754662488. OCLC 461323906. Hayes, Kevin. The Library of John Montgomerie. Newark, DE: University of Delaware Press. ISBN 9780874137118. OCLC 247735151. Kammen, Michael (1975). Colonial New York: a History. New York: Scribner's. ISBN 9780684143255. OCLC 1230649. Kierner, Cynthia (1992). Traders and Gentlefolk: The Livingstons of New York, 1675–1790. Ithaca, NY: Cornell University Press. ISBN 9780801426384. OCLC 24319878. Leder, Lawrence (1961). Robert Livingston, 1654–1728: and the Politics of Colonial New York. Chapel Hill, NC: University of North Carolina Press. ISBN 9780807808054. OCLC 312348155. Leonard, John (1910). History of the City of New York. New York: The Journal of Commerce and Commercial Bulletin. OCLC 1075554. Lustig, Mary Lou (1995). Privilege and Prerogative: New York's Provincial Elite, 1710–1776. Madison, NJ: Fairleigh Dickinson University Press. ISBN 9780838635544. OCLC 29635211. Purvis, Thomas (1986). Proprietors, Patronage & Paper Money. New Brunswick, NJ: Rutgers University Press. ISBN 9780813511610. OCLC 12947737. Spencer, Henry (1905). Constitutional Conflict in Provincial Massachusetts. Columbus, OH: Fred Heer. OCLC 2013049. Stearns, Raymond Phineas (April 1946). "Colonial Fellows of the Royal Society of London, 1661–1788". The William and Mary Quarterly (Third Series, Vol. 3, No. 2): 208–268. JSTOR 1920323. Taylor, Daniel (1882). The Reign of Christ on Earth. London: S. Bagster and Sons. OCLC 316489316. Thwing, Annie Haven (1920). The Crooked and Narrow Streets of Boston 1630-1822. Boston: Marshall Jones Co. OCLC 526147. The Philosophical Transactions of the Royal Society. London: C. and R. Baldwin. 1809. OCLC 18571479.